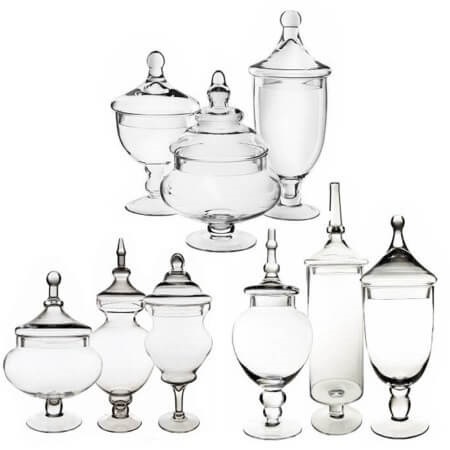 Nine Glass Apothecary Candy Jars in a range of shapes and sizes are a perfect array for candy buffets! 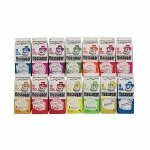 Nine jars that are a range of shapes and sizes which compliment each other well. 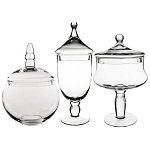 Set up a table, cover with a beautiful cloth and arrange these glass candy jars in a stylish presentation. 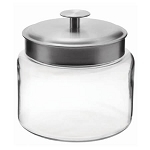 Now you have the open canvas of glass buffet jars to fill up with any candy or treat you can think of. Match the color choice for the event or go with the theme of the event, but have a great time getting creative and personalizing your celebration. 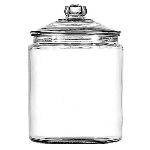 Candy stores are going to truly shine with this set of glass jars. When customers walk in and see the nostalgic appearance of the candy jars it is sure to draw them in. Load up each glass jar with bright and colorful candies, fun shaped and themed sweets or bring back memories with retro candies. Order yours today! Height: 10" Opening: 5.25" Body D: 7"
Height: 9.5" Opening: 5" Body Width: 6" Base: 4.5"
Height: 13.5" Opening: 4.75" Body Width: 6" Base: 4.5"
Height: 16.5" pening: 5.75" Body Width: 6.5" Base: 5" Thickness: 1/8"